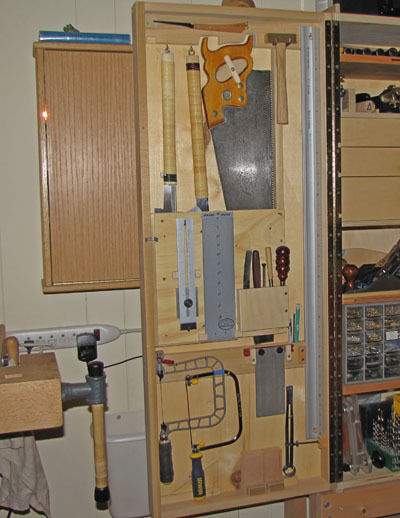 In small-shop woodworking, space management is important, unless you happen to have just too darn much shop space and don’t know what to do with all of it. Anybody? I guess not. 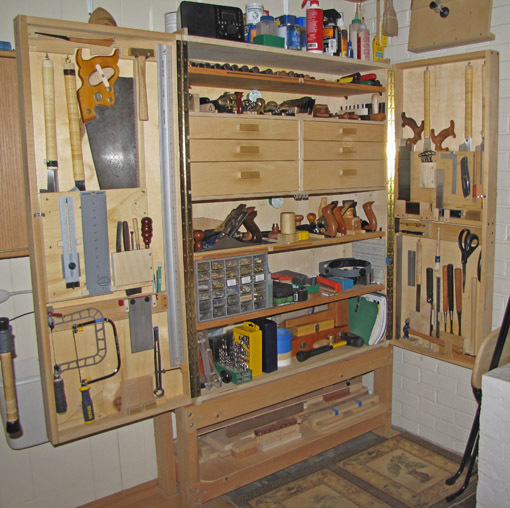 OK, then, let’s look at space economy and overall organization in this tool cabinet. A structure of this size effectively creates walls that can be put to use. 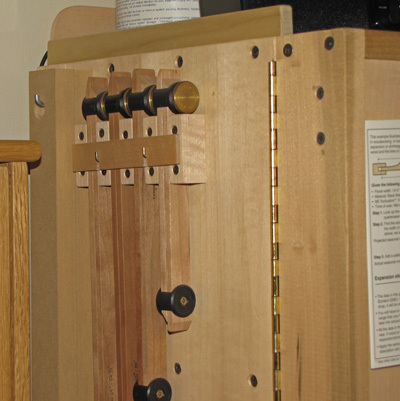 On the left outside “wall” of the cabinet, hang four pairs of pinch rods, a pair of 30″ winding sticks, and a 4-foot stick for trammel points. The right side (hidden from view) provides storage for a crosscut handsaw, a 50″ straightedge, and a 24″ level. The left door front holds a couple of handy reference charts and the Lee Valley Wood Movement Reference Guide. The insides of the doors hold mostly saws because they are big, flat, and would be awkward to store on shelves. Paring chisels are too long for the depth of the case so they get an area on the lower right door. 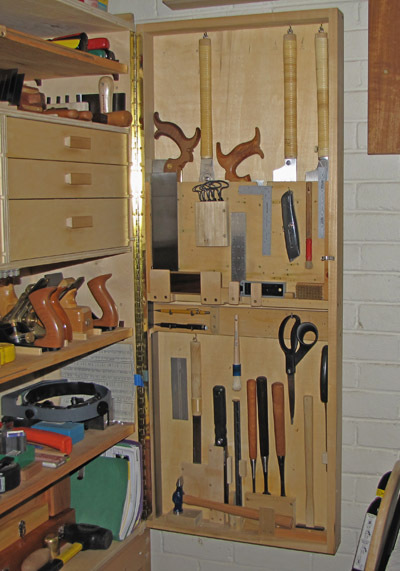 Most of the remaining door space is used for measuring and marking tools that I use very often such as marking knives, everyday squares, rules and pencils, as well as sundry items whose berth evolved there. The holders for these tools will be discussed later, but here I emphasize that the layout often changes. 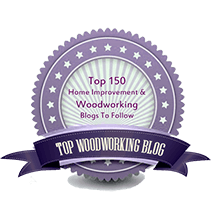 If a new or upgraded tool comes into the family, I have no qualms about drilling some new holes, making a new structure, or cutting out a place for it. I don’t mind one bit that the doors are pockmarked with some tool history. The top shelf holds chisels and screwdrivers. The second shelf has small planes, scrapers, gauges, and spokeshaves. The six drawers: 1) metal working tools, 2) Starrett and other precision tools, 3) drilling accessories, 4) small planes, plane irons, gauges, 5) rasps, 6) machine accessories, wrenches. The next shelf down has the large planes. One minor disadvantage of this cabinet is having to remove two jack planes to reach the jointer in the back. The lower two shelves hold a 30-drawer small parts chest and a variety of other items including more drill bits, tapes, moisture meters, tool manuals, and a set of carving tools that I should use more often. The key points are space economy, flexibility, accessibility, a generally logical layout, and a non-pretty, very practical approach. Next: a closer look at the doors and the saw berths. Thanks for the peek inside. You say that it is “non-pretty”, but I think there is beauty in the clever layout and something very pleasant looking about this piece that does its job to perfection.